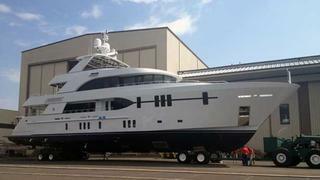 The first 36.5m (120') motor yacht built in the alliance between Ocean Alexander and Christensen is due to be launched on Friday 24 August 2012. This is the first of three contracts in the alliance between Christensen and Ocean Alexander, with interior design by Evan K Marshall. The tri-deck yacht includes features such as an on-deck master suite, separate captain's quarters, crew for six plus captain, massive storage space, walk-in pantry and full-size freezers.